It sounds like a cushy gig, but on the off chance you said no, let me rephrase the question a little. Do you want to spend two weeks driving around a tropical island to gather map data, while being paid a silly amount of money to do it? If so (and I really hope you're all with me by this point) then TomTom wants to talk to you. They've decided that it's time for them to get the mapping done for a few of the places that they haven't got in their systems yet. 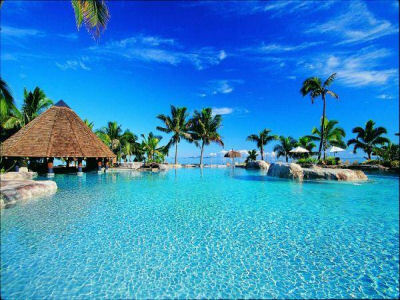 Places like Fiji, St. Lucia, Mauritius, Cape Verde, and the Seychelles. If you and your family are willing to spend two weeks doing a little light work on one of these beautiful islands, then TomTom is willing to put you up in a four star resort, pay for all your food, take you on some tours and adventures, and throw in $15,000 as a thank you for all your hard work. Really, this sounds like a perfect job for my family, as we tend to end up driving on every single road in existence wherever we go. Sure it's usually because I took a wrong turn or something, but either way we'd get the job done. I did notice that the official rules say that it doesn't have to be a family but it can be a group of friends instead, so I'm trying to decide if my kids would really appreciate the subtle nuances of the sandy beaches in St. Lucia. I'll probably make that decision after their year end report cards come home next week. Each island has it's own separate contest running for two weeks. The one running right now is Fiji (May 31 - June 14), then St. Lucia (June 14-28), Mauritius (June 28 - July 12), Cape Verde (July 12 - 26), and it finishes with the Seychelles (July 26 - Aug 9). Eligibility is limited to those people who live in Argentina, Austria, Belgium, Brazil, Canada, Denmark, Finland, France, Germany, Ireland, Mexico, Netherlands, Norway, Portugal, South Africa, Spain, Sweden, Switzerland, United Kingdom and the United States, although for some reason, people who live in New York and Florida aren't eligible. Who did you guys piss off? What does it take to enter? A couple of simple questions, and a no-more-than 200 word passage on why you think you would be a good candidate for the job. Don't worry about the fact that I'm obviously the ideal person because I'm only allowed to win once, so there's still four islands left for you guys to get in on. Here's the link to TomTom's Map Paradise Project (Warning: Ukulele music ahead!). Go check it out and get yourself entered. If you happen to win, remember that you don't have to take your family, you can take friends, and could there be a better friend than the guy who told you about this contest? No, I didn't think so. I'll be awaiting your call on our departure date.